(1)Pretreatment contrast-enchanced computed tomographic scan showing infrarenal abdominal aortic aneurysm(arrow). 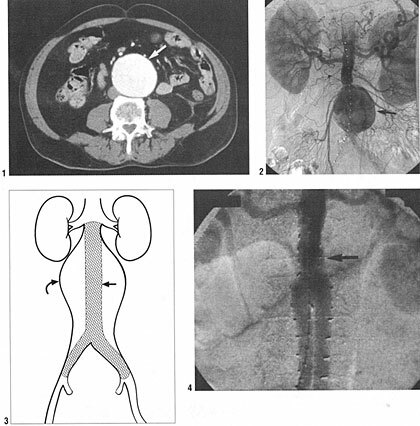 (2)Pretreatment angiogram showing infra renal abdominal aortic aneurysm(arrow). (3)Illustration demonstrating complete exclusion of infrarenal abdominal aneurysm(curved arrow) by bifurcated stent graft(arrow). (4)Intra angiogram showing stent graft in place within infra abdominal aottic aneurysm(arrow).